The Camon C9 is fitted with a 5.5-inch diagonal display with an IPS screen resolution of 1920 x 1080 pixels. A pixel density of about 367 pixels per inch promises decently sharp images. 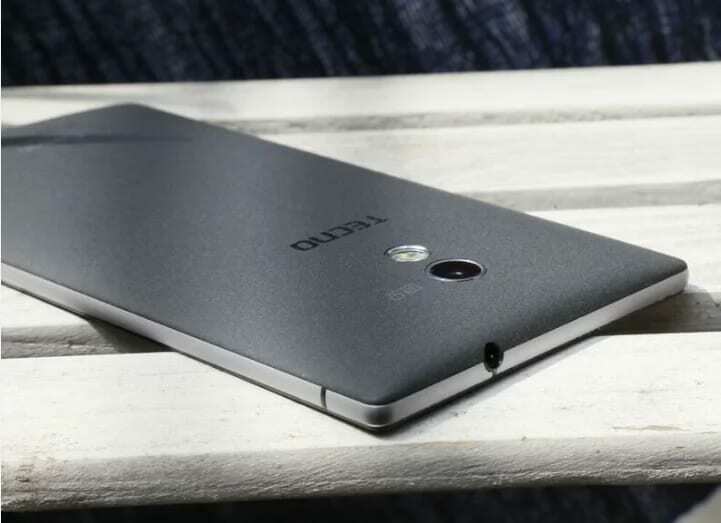 Also, the stylish finishing of the Camon C9 seems to be enhanced by a slighty cambered body. The phone parades an attractive and elegant design, but that is not to say it will win an award for its looks. The Camon C9 packs the sort of cameras we now expect to see on most smartphones. It is equipped with an unbelievably huge and innovative 13-megapixels front facing snapper with dual flash which will be able to capture breath-taking photos and a 13-megapixels rear shooter also with a rear dual flash, autofocus and HDR which should let you capture sharp images without wasting precious time. Both capable of capturing the best moment images even in low light area. The phone has an integrated camera hardware like f/2.0 aperture and 6P coaxial lens. The f/2.0 aperture allows more light into the camera while the 6P coaxial lens helps to capture vivid and colourful images. Tecno Camon C9‘s low-light performance is 15% better than Camon C8, the front facing camera of Camon C9 is powerful and the deal here is the wide angle capability of the front camera. It is 83° wide and can capture more people in a single selfie. I have some breath- taking images shot by the device and they are really good pictures. Camon C9 is a must have device if you care about quality photos. The Camon C9 will be the best selfie camera phone ever. One can now capture the best moment even in the dark with the innovative dual flash on the front-facing camera. The 13MP rear camera on the camon C9 is more improved than the one on Camon C8. The camera is fitted with f/2.0 aperture diaphragm that enables it to let in more light, thereby producing brighter images in a low light environment. Tecno C9’s rear camera has a higher light intake ratio in low light conditions compared to iPhone 6 Plus. This is the first time Tecno will be producing a device with a whooping 13MP front camera and Tecno says it is not in competition with anybody but with itself. The wide angle capability of the front makes it possible for capturing more people in a single selfie. It’s 15% wider than competition. This can further be extended to 120° panoramic mode that can capture lot more than the normal mode. Here are some of the selfie shots captured by the Tecno Camon C9 front facing selfie camera. Under the hood, Tecno Camon C9 is expected to come with an increased octa-core processor clocked at 1.5 GHz or 1.7 GHz. the device is paired with a RAM of 2 GB to make the phone capable of delivering a high level of performance that will be more satisfactory to users and multi-tasking a breeze. Its graphics processing is seen to by a Mali-T720 GPU. We may just be expecting a fingerprint scanner but it came out to be an iris scanner that lets you unlock the phone with your eyes. Recall that the Phantom 5 was Tecno’s first fingerprint smartphone, the response time and false rejection rate actually beat that of the iPhone 6 and Galaxy S6. Tecno C9 boots Android 6.0 Marshmallow operating system, which is the latest iteration of the Google software. It is also laced with Tecno’s UI – HiOS and juiced with a 3,000mAh battery unlike the Tecno L8 with larger battery. We also expect a 4G LTE connectivity on the device. Exciting hearsay, the more reason I would hasten up on this review, we need to see things for ourselves. I would bring you reports in a few days. Watch this space. This is an in-depth review of the Tecno Camon C9, its Price, photo comparison with iPhone 6s Plus and lot more. Does anyone have a problem with storage yet? Yea. I think this phone is dominating . I like esp. the iris scanner and battery life. I think var the phantom 6 and 6+ this phone has the best camera on a smartphone ever. I definitely enjoy you writing format. Am searching for a nice tecno phone to purchase, I thing Tecno camon c9 really meet my need!!! please all the capacities about the c9 are ok, but what of the battery capacity? Its equipped With a 3000mah battery and I think it’s more than adequate. No it doesn’t. But it has an eye print scanner that is equally as effective. Who get this second girl number? Whoever argues the beauty of this device needs spiritual washing of eyes though. Though, one might be scolded for comparing in the long run,but i think camon c9 measures up to Iphone in more ways than one. I believe I was clear enough. One thing I know for sure is that in terms of specs and general acceptability….in my opinion, C9 is better than iphone 4s. About iphone 6s, I am not sure cos I have never used it. That’s something I was going to point out, having a camera in the middle like that is innovational. Wow! Dats gud, but hw much is it? When will it be available in Uganda, and at how much in terms of Uganda shillings or dollars. Am impressed. beautifully made I hope oluwa is involved? Comment…actually its the best phone i think they should just improve the rear camera atleast 21mega pixels. That eye scanner is a burst brain feature. I’ve tripped countless friends with it. Cool stuff bro, keep it up. The Camera is the bomb my dear. Hw much will it cost?? Funny how its much cheaper than the C8 yet has better specs. Or is there anything we’re missing somewhere? Where did you get the price from? Seriously???? When is this coming out? Jumia Mobile Week Reloaded” that will last for seven (7) good days starting 30th of May through 5th of June.